Note: this is a very image-heavy post, and most of them appear ‘below the fold’. Although we faced significant challenges during this trip, it was nonetheless a very productive one. I was joined by John Henry, the photographer who was with me when I recorded kent-like calls in March 2013. Work obligations kept Frank Wiley out of the field, except on February 24th. A flight delay and 1:20 am arrival at my hotel in New Orleans on the morning of the 20th limited my field time to a couple of hours on that day. I had planned to get in a final half day on the 25th, but wintry precipitation prevented it. Weather conditions were a challenge throughout – skies were consistently cloudy and dark; there was occasional rain; and temperatures fluctuated from the 70s on Friday and Saturday to near or below freezing on Monday and Tuesday. On the afternoon of the 20th, John Henry and I went to the eastern sector, the most easily accessible part of our search area. This is the vicinity where a visiting biologist, Frank, and I heard double knocks during my last visit, and where we have found a significant amount of feeding sign since 2012. I found some fairly impressive, extensive, and recent bark scaling high on the trunk of a fairly distant tree. I was unable to examine it up close, but from a distance it appeared to be consistent with what I think is likely, if not diagnostic, ivorybill work. On a non-ivorybill related note, the feral hog population seems to be increasing in our area, and they do enormous damage to the habitat, probably not in way that impacts the ivorybills we believe to be present, but their impact on forest ecology is likely severe. 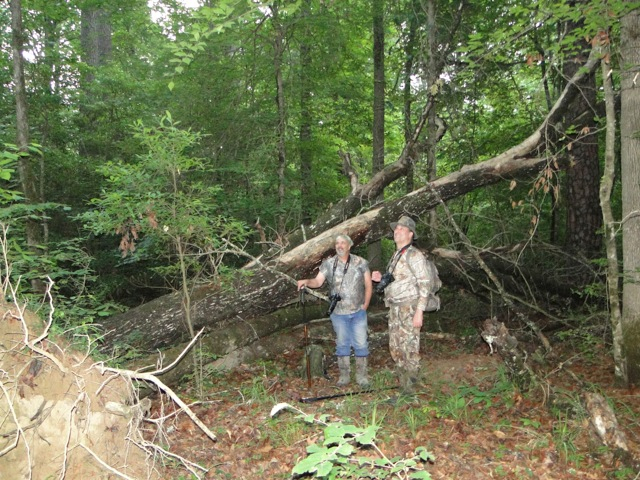 While they are hunted by some in the area, and don’t seem to be nearly as abundant as they are in Congaree National Park, for example, they are still a severe problem. Edited to add: This poor photograph of large, relatively slow moving terrestrial mammals, the best of several taken at less than 100 yards, illustrates just how difficult it is to obtain good pictures in this environment. On the 21st, John Henry and I went into the habitat on through the northwest corner. This is an area of fairly recent blowdown, several deep, meandering sloughs, and dense blackberry thickets, making it incredibly difficult to explore. On more than one occasion, we had to retrace our steps and find a different route. I estimate that we were able to cover a quarter mile per hour. Traversing this area is hard on body, boots, and clothing, and it’s very difficult to pay attention to anything except the next step. We finally reached the site of the target tree featured in Frank’s Pros and Cons of Trail Cams and where I recorded a possible DK in response or reaction to an ADK. We decided to do a double knock series. Following Frank’s lead, I did a little pounding on the log before doing any DKs. Then I did a DK (I wasn’t recording, as I was using an external microphone mounted on my camera and figured I’d turn it on when I finished the series). Within approximately 10 seconds, there were 3 extremely loud single knocks that came from east-southeast of us. I’d estimate they were spaced about a half second apart and were no more than a couple of hundred yards away. Nothing else happened in response to the series. Although they didn’t have the resonance of typical woodpecker drumming, they didn’t sound like branches breaking, gunshots, or industrial sounds. There were no hunters in the immediate vicinity, no vehicles parked along the access road on our way in and out of the area, and we heard nothing remotely similar during the rest of the day. On the 22nd, Frank and I made a pilgrimage to meet J.J. Kuhn’s daughter (known to us as Mrs. Edith) who had honored us with an invitation. We spent a delightful afternoon with her and her daughter, son, and son-in-law. They regaled us with many stories about Kuhn’s life, before, during, and after his time with Tanner. As readers know, we see Kuhn as the true master at finding ivorybills. Mrs. Edith is writing a biography of her father, so we’ll leave it to her to tell the story. During our absence, John Henry visited the northern sector and reported hearing a double knock late in the afternoon. He also spoke to two local hunters who claimed to have seen ivorybills. The elder of the two men said he hadn’t seen any recently but had seen a pair 15 years ago in the area that’s discussed in the first and last paragraphs of my previous trip report. This is the third local person to have claimed a sighting in that general vicinity. The other person’s claim was of a sighting at the south end of what I refer to as the northern sector, so John and I decided to explore that area (which had not been visited) on the 23rd. As is so often the case, travel was complicated by deep, meandering sloughs, although it was nowhere near as difficult as what we encountered on the 21st. We did not have any possible auditory or visual encounters, but I did find one very impressive looking cavity (although not a fresh one) and a downed sweet gum with very extensive and fairly recent bark scaling. John next to the main trunk to provide a sense of scale. This type of work is similar to work found last year. and while it doesn’t exactly meet the criteria I’ve laid out previously for what’s diagnostic, I strongly suspect that it is Ivory-billed Woodpecker work, beyond the physical capacity of a PIWO. The bark was tight and difficult to impossible to remove without an implement. Frank joined us on the 24th, and we entered the eastern sector farther north. The hike in at this location is long and difficult, but our efforts were rewarded, and we gained quite a few new insights. Once we were well into the bottomland area, we experimented with doing some playbacks. Frank played some Pileated Woodpecker calls and drums, which stirred up a good deal of activity. One Pileated flew in silently, and several others called with the rapid, “cackle” call and drummed in the distance. He then switched over to playing the Singer Tract recordings, and two more Pileateds flew in to the trees just overhead. They drummed and did the “wok” call, apparently in direct response to the recording. It is at least intriguing that playback of ivorybill calls would produce such a response from Pileateds. We packed up and headed deeper into the habitat and found a sweet gum with three large, oval shaped cavities. The lower cavity is the most obvious; the other two are near the top, partially obscured by branches. About a hundred yards away, I came across another downed sweet gum with extensive and suggestive scaling and large bark chips underneath; one of the chips, shown below, appears to have strike marks that are suggestive of IBWO, similar to the ones discussed in this post. I failed to get clear photographs showing the extent of the work on this downed tree, partly due to angle and lighting and partly due to the events discussed below. Large bark chip with apparent bill strikes. Detail of downed scaled sweet gum. This limb, which was somewhat punky, had been fully stripped of bark, apparently after it fell. Also note the scaling in the background. There was a nearby hickory snag that had been heavily scaled in the manner that I think is diagnostic, although not recently. John had moved some distance away while Frank and I examined the tree, and I started taking pictures. As we were doing so, we heard two distinct double knocks in close succession, roughly from the south. This was at approximately 11:15 AM. We remained in place for 30-45 minutes at which time we played back the Singer Tract recordings. John had moved closer to us. Within 30 seconds to a minute of the playback, Frank and I heard a kent-like call. We disagreed about the direction. Frank had it from the Northwest, and I thought it was from the West. Between 30 seconds and one minute later, a large black bird flew in from the west at about 85 yards. My view was fully obstructed, but Frank saw it for several seconds before it took off, at which point John saw it but could not distinguish any field marks. The quantity of suggestive and recent bark scaling I found on this trip relative to time spent was remarkably high, as was the possible encounter rate. I hope to return the search area in about a month and may do one or two posts on other subjects before then. Stay tuned. Hello, first off, I enjoy your blog and follow it regularly and look forward to updates. I live in Maryland, a state not known for IBWO. However, I do spend time in the Maryland woods and quite frequently come across dead trees with missing bark that look identical to the trees in your photos. Also, many of the trees in your photos appear long dead which is contrary to IBWO preference. I understand that photos often times don’t convey the subtleness of real life and maybe that’s the case here but after reading your “Cavities and Feeding Sign” entry, I still feel like I am missing the IBWO connection. Thanks for the comment and question. Very few of the trees in these images are long dead, and I generally indicate when they are. The downed sweet gums in the trip report, for example, still had twigs and leaves attached, and the bark was mostly very tight. The bark on the hickory on the homepage could only be removed with a hatchet. Chip size is another important consideration. You might want to look at the “Sweet Gums to Sweet Gums and More” post for further elaboration. In some cases, when I refer to “old scaling” or sign, it’s on long dead trees, but there are nuances of appearance that I now think I can recognize based on a lot of observation. Regarding feeding on long dead trees, it’s pretty clear that ivorybills did feed on them. Look at Plates 9-11 in Tanner. My focus has been on finding diagnostics. Photos may not do justice to the entire gestalt, but I’ve done my best to explain what I look for.